Dragonscale Hills is one of the best locations for players 70 - 80; there's multiple different group locations as well as a good amount of spaced out enemies for those looking to solo. 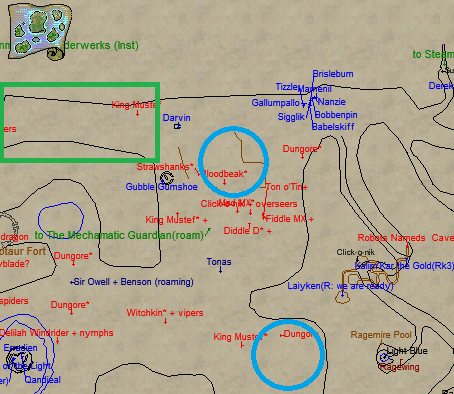 On the map above, the northern most blue circle is where you'll find The Farm, the most well known Dragonscale Hills location. Northeast of The Farm you'll find a camp of Gnome NPCs, speak with Sigglik for tasks to defeat the different enemies that you find at the farm and throughout parts of the zone. The enemies for Farm Clean Up - Crows, Scarecrows can only be found at the farm; but the last quest, Farm Clean Up - Doombugs are found throughout a lot of the zone. If you're here to level up I recommend that you do these three tasks. They all give decent EXP and all you have to do is defeat 12 enemies of each type to complete the quest. Northern Blue Circle: The Farm, the most well known/most visited camp in Dragonscale Hills. Southern Blue Circle: Dungore/Carcass Location. Aside from the enemies that are found at farm, you'll also find an assortment of different animals scattered throughout the zone. One of the nice upsides about the animals too is that they usually come in much smaller pulls than what you find elsewhere in the zone. This makes them the prime solo targets of the zone. Beware though, if you can barely handle the animals that're found here you definitely won't be able to take out the nameds. Finally the last type of enemy that's found in the northern parts of Dragonscale Hills are the clockwork guys. These enemies hit extremely hard in comparison to what you find at the farm and elsewhere in the zone. I mean like jeeze louise they can be annoying even for someone whose 100 + if you end up agroing too many. The large purple marking on this map is where you port into Dragonscale Hills at if you take the Guild Hall portal. Surrounding this lighthouse type structure you'll also find Nymphs/Fairy enemies which can be Assassinated, Headshot and Decapped. 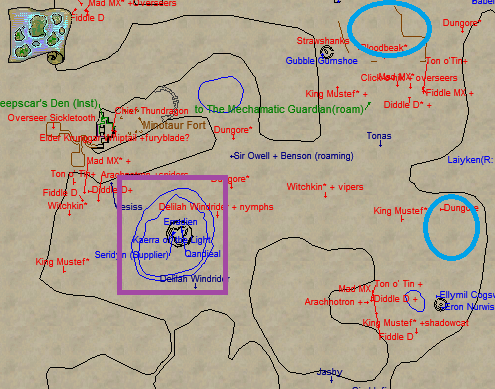 If that isn't enough for you, further north of the lighthouse in the nook on the map you'll find a bunch of Minotaurs.